When you got your Platypod you’ll have likely noticed one important quality is the ability to secure it to things using the strap included with your Ultra (20 inches) or with the tension strap (36 inches) in the Multi Accessory Kit (36 inches). This can be used to secure the Platypod to trees, beams, poles, or other freestanding objects to give yourself a steady hold and a change in perspective. First up, Norway. This shot is from Hamnøy in the Lofoten Islands. It’s a fantastically beautiful place. To get this shot I had to walk up onto a tall road bridge that connects the islands and archipelagos of the Reine area of the Lofoten Islands, in this case connecting Hamnøy with Toppøya. The bridge has a small footway on the north side with a high railing protecting walkers from the fall to the rocky sea below, and it’s this railing to which I attached my Platypod Ultra using the included strap. The advantage I had here is that the railing is so high and the footway so narrow that had I used a tripod I would have been positioned further away in order to spread the tripod legs and attain stability, however the ability to attach my camera to the railing itself afforded me a much wider view with my 14-24mm lens with no obstruction whatsoever between me and the water below. As you can see from the final image, the ultra wide view gives a new perspective to a view that’s become familiar due to Insta-tourism. 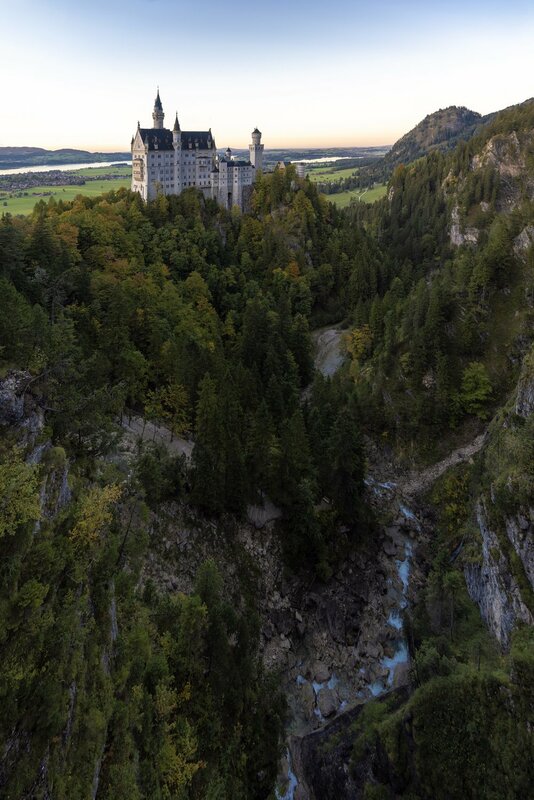 Another place I’ve used this method recently is on Mariensbrucke, the footbridge that crosses a gorge in the Alpine foothills behind Neuschwanstein Castle in German Bavaria, the castle from which the Cinderella Castle by Disney was inspired. The thin handrail on this bridge was presented no problem for the Platypod, only for my fear of heights! The only real problem I faced in a photographic sense was the movement on the loose bridge caused by crossing pedestrians, which was nothing compared to the quake in my legs caused by the dramatic looking rocks and flowing river below me with nothing but planks of wood and strands of steel in between! Finally, I was very impressed with the Platypod strap when I used it at Halstatt in Austria. Bordering Halstattersee in the Alps, within the Salzkammergut and as that name suggests being famous for salt, this village of Alpine homes and buildings is littered with narrow alleyways and has a waterfall cascading from the mountain looming high above. Walking out of the centre to the south there’s a very narrow road set practically on a cliff edge which offers a great view back towards the ‘zentrum’ where the spire of the Evangelical Church of Halstatt, built there in 1785, rises above the surrounding buildings. Along with friends from Team Epic, I arrived here before golden hour and wanted to frame my shot and keep my perspective during the changing light. I wasn’t in possession of a tripod at all on this trip, as is so often the case for me now, and when I saw the tubular railings and curved-topped pillar I was in two minds about what to do but I’m glad I went with my instinct and trusted the capability of the Platypod Ultra and its strap. I was able to secure my gear to the flat vertical edge of the fencepost and angle my camera to face the scene, maintaining its position for at least an hour whilst I waited for the right light. The strap that comes with the Platypod Ultra, as you can see, is infinitely useful and of great quality. It’s as important a part of the kit as the screw feet are and wherever my Platpod goes, the strap goes too. Here are a few more edits. Which do you like better?